He will double every dollar raised to build an orphanage. 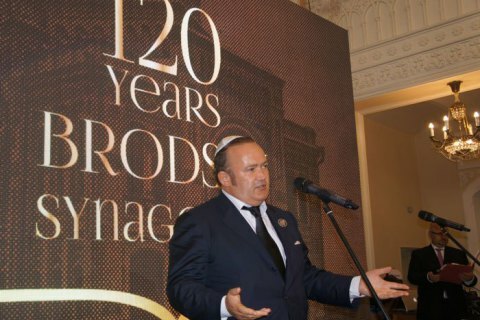 As of 27 August, the Jewish community in Ukraine and abroad is raising funds to collect 1m dollars for the construction of an orphanage for 60 children in the village of Anatevka, Kyiv Region, US businessman Igor Fruman has said at the 120th anniversary of the Brodsky Central Synagogue in Kyiv. He chairs the American Friends of Anatevka charity. Anatevka is a residential and education town for internally displaced persons of Jewish origin from eastern Ukraine. It is a key charity project of the Brodsky Synagogue, which was initiated by Ukraine's Chief Rabbi Moshe Reuven Azman. Fruman promised to double every dollar raised for the project. Donations are being collected on Anatevka.com. On 26 August, the Brodsky Synagogue marked its 120th anniversary. The event was attended by politicians, businessmen and artists of various ethnic backgrounds. Ukrainian Prime Minister Volodymyr Groysman and his Israeli counterpart Benjamin Netanyahu sent their greetings. "We deeply appreciate the support provided by the Brodsky Synagogue during the Orange Revolution and especially during the Revolutio of Dignity. Your active position has changed Ukrainian patriots. Fighting close to me on Maidan were people who made tattoos in the shape of a trident with the Star of David. Therefore every Ukrainian nationalist today is an equally ardent Zionist," the head of the Kyiv regional state administration, Oleksandr Horhan, said. Poroshenko about McCain: "Ukraine's big friend is gone"
Poroshenko: "We are determined to end dependence on Russian church"
Poroshenko: "Make independence - irreversible, Ukraine - great and strong"